One of several recent 'crisp' mornings, saw me driving up to Orford to have a look at the spit, with a plan B, to drop into the Wielangta Forest. As it turned out, Orford was overcast and somewhat foggy, so plan C was a drive further up the east coast to Triabunna and beyond, hoping that by the time I returned, the sun would have broken through. In no particular hurry, I drove out towards the coast to a spot that on several occasions, I've found a White-bellied Sea Eagle in an old, cliff top eucalypt, a tree with a view. No eagle this morning, instead, I stood and watched a dozen or more Australasian Gannets fishing way out in Great Oyster Bay. Little Pied and Black-faced Cormorants flew past me on their way to join them, as did scores of Crested Terns. A cool breeze eventually drove me back into the shelter of my vehicle, and I sat there and contemplated my next move. 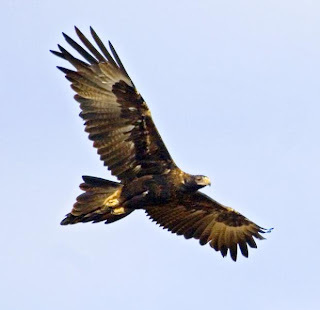 Far down the coast I noticed a large bird flying towards me, and a quick look through the binoculars established that it was a Wedge-tailed Eagle, a fairly common bird of prey around here at this time of year. I sat and waited as it came ever closer, hoping for a 'photo opp'. Things were looking h opeful, and I finally got out of the car and prepared, but my hopes were dashed when it flew down the other side of the bay and into a clump of Blue Gums. Still a possibility, I reasoned, as the track ran quite close to the gums. Off, back down the track, but a close scrutiny of the trees failed to find any eagle. Time to go back to plan A, Orford Spit. As I drove down the dirt track towards the highway, I had a quick glance at another tree where I've noted eagles of both persuasions over the years. I did a double take, and braked hard. 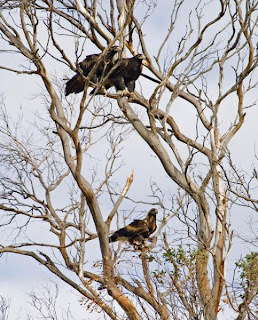 A quick look through the binoculars, yes, there was indeed not one, but three Wedge-tailed Eagles. A presumed pair together near the top, and a somewhat 'patchy' plumaged bird lower down (top left). As they were close to the track, I had high hopes of getting some reasonable images. From there on, photographically speaking, things deteriorated. I think I was so driven by the possibility of some good shots, (in my mind's eye, I think I could already see them), that I omitted to check the camera settings. Bad move! I walked towards them, stopping to take an occasional shot, and mentally registered that all was not well with the camera settings, but chose to ignore that. The lower, immature bird, took flight, and soared slowly in circles above me, I took several sh ots and stopped to review the images. All was indeed not well. I quickly chose what I thought was the right settings, but my mind was very much focused on the eagles. The immature bird alighted back in the tree, and the very dark, almost certainly adult male, took off. More shots. As I closed on them, the remaining birds took flight, and all three circled the hill, but appeared reluctant to leave (not that I wanted them too!). A score or more photographs later, I left them to it, confident that I'd managed a few decent shots, and they returned to their roost tree. My optimism proved wrong, as most of the shots had been shot at completely the wrong settings. Obviously in my haste, I had set the camera up incorrectly, and my attempts to correct them while my thoughts were elsewhere, only made things worse. The outcome is that I managed to resurrect a few, two shown here. I also resolved to check before I shoot, and I suspect I will, for a while! Despite the disappointing shots, watching the 3 Wedgetails circle around me at tree top height, made for a memorable morning. A fascinating - and obviously frustrating - episode of bird watching! The photos you have posted here are still very good. I'd sure be happy to get some like that! My problem, apart from the camera settings issue, was that I had such high expectations of the images, and that, before I'd taken a single shot! It's not the first time this has happened, and I doubt that it will be the last. It was a great experience, nonetheless, to have these birds flying so close and, seemingly, so unafraid of my presence. What a wonderful opportunity to stumble upon . Although a big bird,I find wedgetails can be hard to photograph (with correct exposure) - and its not as if we can ask for a reshoot! Still a great moment seeing three at once. I seen two from my backyard last year (one of them far off) and that was pretty exciting. The photo still shows a lot of detail which is great. Does shooting against the sky like that often give underexposed birds. If so, what do you normally do to avoid it? Do you use the exposure compensation feature? I sympathise with you re the camera settings issue. That's why they make automatic settings too. But still, your few photos are quite extraordinary. The wing-tips spreading in the wind, etc are very good. Perhaps not the award-winning inages you hoped for, but pretty bloody good, really. Most of my eagle shots start with small dots in the sky. We all live for the day that they hang over you like that. Enjoy the memory. Thank you all for your comments and commiserations. Of course it was a great event and no images were ever going to capture the joy of having eagles wheeling round me at low height. I often find that my shots don't capture those moments as I remember them, and I usually walk away from my computer, returning later to find that they're not really as bad as I thought. I'm sure we all do that. I can live with that (just), but when the images fail because of my own incompetence, that's another thing. Wedgetails, being dark and often photographed against a bright sky, do present their own difficulties. I do use exposure compensation, but in this case, with the birds being so close, it was possible to get exposure readings off the underside of the birds. I think in this scenario, the excitement of the moment overcame my ability to set the camera up properly, I should have prepared it before leaving the car. They also fly deceptively fast, and that added to the camera issues. I do get excited and quite tense photographing birds. On one occasion I could hear what I thought were approaching footsteps, only to realise that I was listening to my own heart pounding! I understand the excitement you describe so well. Careful of the thumping heart beat though. We don't want a coroner to declare "photographer killed by eagle" - even though it would make a great headline. I described my own little jumping for joy at finding a rare Orchid a few days ago, but they stay still after my little expression of excitement. 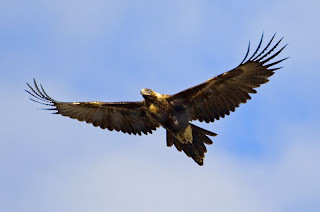 Eagles can fly deceptively fast. Most of us would be very happy with your photos. But you are still doing the "oh what might have been" thing. Relax! I share your joy of finding orchids, rare or otherwise. Sadly I don't find as many as I did many years ago. (Could be partly due to spending more time looking up, not down though!). The particular episode I mentioned was while photographing the local endemic, Scrubtit. I don't think the headline would read quite so well. You're probably right about relaxing (my family medical history doesn't read well on the heart attack front), but the adrenalin rush of photographing, or just being so close to birds while attempting to photograph them, is hard to beat. I fully understand Alan's frustration. How often when faced with a rare photo opp have I suffered the adrenalin rush/goodbye camera sense syndrome. The fact is the family scene Alan captured doesn't come around too often, and it portrays the closeness of a wedgetail family. Although such large and powerful birds, I have found them one of the most gentle and caring of their young, and generally unaggressive towards other birds. These are some of the traits as an amateur photographer I try hard to capture.